Why Do I Only Read the King James Bible? Why I Only Read the King James Bible? God is immutable (unchangeable). God does not change! God's Word is unchangeable too. In Matthew 24:35, the Lord Jesus said, "Heaven and earth shall pass away, but my words shall not pass away." We read in the Old Testament, "For ever, O LORD, thy word is settled in heaven" (Psalm 119:89). The last word of Revelation existed in heaven before the first word in Genesis was ever written. Jesus is the Living Word; the Bible is the Written Word. "In the beginning was the Word, and the Word was with God, and the Word was God" (John 1:1). "And he was clothed with a vesture dipped in blood: and his name is called The Word of God" (Revelation 19:13). Jesus also said in Matthew 4:4, "...Man shall not live by bread alone, but by EVERY WORD that proceedeth out of the mouth of God." If I am to live by "Every Word" of God, then I need an "Every Word" Bible!!! Since all of the hundreds of bibles on the market don't say the same thing (and they don't agree), then they CANNOT ALL be God's Word--no way! God only wrote ONE BOOK! I've been amazed for years now, how God-fearing Believers can recognize false religion but fail to detect false bibles. We can recognize counterfeit dollars, but not counterfeit bibles. Folks! God never changes! 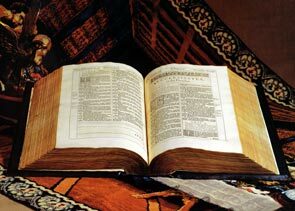 Why then are we so ready to accept changes to God's Word in the form of different Bible versions? The Authorized King James text has faithfully served the body of Christ for almost 400 years. During this time, and during its translation, Satan has viciously and relentlessly attacked it. I now hear Christians attacking it too! I've heard preachers and lay people say things like, "it's too hard to read" or "it doesn't properly reflect the true meaning of the original Greek." These are poor excuses. Do we rewrite Shakespeare? Of course not! ; rather, we study Shakespeare in the beauty in which it was written. The Authorized 1611 King James Bible was translated in the most beautiful period of English literature; It is ridiculous to water it down to the silly so-called "translations" which we have available on the market today. They are mistranslations! The issue about the original Greek is really irrelevant! Do you know why? Simply because you and I were not there! I cannot prove anything to you from history, and you cannot prove anything to me. There are so many theories and "so-called proofs" that it is ridiculous. Prove to me that Julius Caesar ever existed! You cannot. Prove to me that Alexander the Great existed! You cannot. Can I prove to you that Jesus ever existed? No I cannot. I can show you the Bible (which alone is enough proof for me), but you may not believe me. Now I believe that Julius Caesar and Alexander the Great really existed. Why? Because of the historical evidence available. Howbeit, you cannot PROVE to me that these men ever existed--I must accept it by faith, based on things I see and hear today. Likewise, a person believes the Bible "by faith." You see, everything we believe about history is "by faith." I once witnessed to a Jehovah Witness; He was a gentleman and new his religion well. We began to discuss the King James Bible verses his "New World Translation." He said that his bible had originated from much more reliable manuscripts than the King James (from the same corrupt source as the New International Version (NIV) by the way, fabricated by heretics Westcott and Hort in the 19th century). To make a long-story short, we never could make it past that key stumbling block--the Bible! He failed to recognize God's Word. He wanted to argue over the Greek. Which Greek? The corrupt Greek out of Alexandria Egypt? Or the trustworthy Greek out of Antioch, Syria? I couldn't convince him of anything. Listen, there are Greek manuscripts galore, including the corrupted manuscripts that the Roman Catholic religion uses; thousands and thousands of manuscripts. What I am saying ladies and gentleman is that we do NOT need a knowledge of the Greek or Hebrew to accurately identify God's Word today. God promised to PRESERVE His Word for all generations, "The words of the LORD are pure words: as silver tried in a furnace of earth, purified seven times. Thou shalt keep them, O LORD, thou shalt preserve them from this generation for ever" (Psalms 12:6,7). God promised to preserve His Word! Just how pure is God's preserved Word? We just read the answer in Psalm 12:6, "...as silver tried in a furnace of earth, purified seven times." The process of refining precious metals (such as silver and gold) involve heating the metals up until the impurities separate. The more this process is repeated, the purer the finished product. God said His Word is as pure as silver refined SEVEN times--now that's pure! Don't you tell me that we don't have God's Word today! Don't try to tell me that my grandmother would have needed a PHD (post-hole digger) to understand the Bible. No sir! The King James Bible has been tested and reads just fine at a 5th grade reading level. My mama didn't need a degree in Greek or a diploma from some university to know that the King James Bible is God's preserved, inerrant, inspired, infallible Word. Phooey on all these nuts talking about the Greek. We read in Luke 7:35, "Wisdom is justified of all her children." God's Children, Who are living to win souls to Christ, recognize God's Word. The snide remarks and attacks against the KJB text are unfounded. "But the natural man receiveth not the things of the Spirit of God: for they are foolishness unto him: neither can he know them, because they are spiritually discerned" (1st Corinthians 2:14). ;hence, paraphrasing or simplifying it will do no good. The Bible is not supposed to read like a fairy tale--Peter said, "...for we have not followed cunningly devised fables" (II Peter 1:16). The words of the Authorized King James Bible are not laborious to me, they are beautiful and full of God's power. Even the world knows it--the Authorized King James has been listed on Norton Anthology's list of "the world's best literature" for decades. Revelation 22:18-19, "If any man shall add unto these things, God shall add unto him the plagues that are written in this book: And if any man shall take away from the words of the book of this prophecy, God shall take away his part out of the book of life, and out of the holy city, and from the things which are written in this book." Deuteronomy 4:2, "Ye shall not add unto the word which I command you, neither shall ye diminish ought from it, that ye may keep the commandments of the LORD your God which I command you." John 3:16, "For God so loved the world that He gave his only begotten Son..."
In this instance, the NIV changes the scriptures by saying that Jesus is God's "one and only Son" instead of saying, "his only begotten Son." This change causes a contradiction in the word of God because God has more than one son according to both the King James (Genesis 6:2, Job 1:6, John 1:12) and NIV (Genesis 6:2). God has many adopted sons, but only one "begotten Son"--Jesus, the only begotten Son of God. It is a wicked sin for anyone to remove the word "begotten" from John 3:16. As I told one Lutheran minister not long ago, "Any bible that does not have the word "begotten" in John 3:16 is going straight into my garbage pail." God only wrote ONE Book, not 400. The English speaking language hasn't changed that much in the last 400 years. It's all about filthy lucre--money, money, money! Just as some evil people prey upon children with their cigarette adds to make a buck, so do evil people pervert God's Word into a watered-down-mess to make a buck. It is a shame, it really is! By the way, the word "Godhead" has been removed from the NIV as well. So wicked! I do not buy the line that the inerrant word of God is found only in the originals (which nobody has by the way). I know that God has the power to preserve His word and that he wouldn't leave us out in the dark with an "imperfect" translation. In the authorized King James Version, God assembled and moved with His Spirit; a team of some of the world's best 48 scholars to translate His word into the world's most popular language, English. Also consider this--Jesus and Paul continually quoted Scriptures from the Old Testament. These quoted Old Testament Scriptures were NOT from the original manuscripts; these Scriptures were learned and quoted from COPIES. So is the New Testament inspired as well as the Old Testament? Of course it is. "All scripture is given by inspiration of God, and is profitable for doctrine, for reproof, for correction, for instruction in righteousness" (2nd Timothy 3:16). The complete translator's notes of the Authorized King James scholars are not included in today's publishings. This is unfortunate because these notes say a lot about these men-- they were humble, they loved the word of God, and they loved the King. They were berated by the Catholic religion and they desired a translation for the common man (who was kept in darkness). Some of the translators where killed for their faith. This Book was forged in blood, sweat, and tears. I've heard folks make a big to-do about the italics in the Authorized KJV. Well, unlike many of today's translators, the authorized KJV translators were ethical enough to let us know which words they had to add in translating. They did this in order to give us the true meaning of the original text (these are the words in italics in the KJV). There is something called "transliteration." It simply means that you MUST follow certain rules of grammar when translating from one language into another. For example: Charles Russell (founder of the "Jehovah Witness" false religion) was taken to court in Canada. The case for the lawsuit involved Russell's "New World Translation" of the Bible. Russell perverted it. He arbitrarily decided to add the article "a" into John 1:1. Whereas the King James Bible said that Jesus "was God"; The New World Translation said that Jesus was, "a god." Charles Russell lost this case in court. You can't just go rewrite something any ole way you feel like it. Basically, Charles was an idiot. Today, the Jehovah Witnesses' try very hard to distance themselves from their goofy founder. He was also taken to court by the Department of Agriculture for fraud. He was selling seeds, claiming they were special and would yield 5 times the normal harvest. He lost in court of course, again (read "Kingdom of the Cults" by Walter Martin for more). The King James Translators went through the necessary trouble of identifying which words they added; That's real scholarship and integrity!!! Thank Jesus for those godly men. Here's why I believe a lot of weak Believers are falling for these other perversions of the Bible--There's an epidemic of "so-called-Christian" books on the market today! An epidemic of "so-called-Christian" radio! An epidemic of "so-called-Christian" TV. Sadly, many folks have been INOCULATED from Christianity. The doctors gives you an inoculation shot to keep you from getting the real thing. He gives you just enough of the DEAD virus, to prevent you from getting the real thing. Satan has succeeded in inoculating people from the truth. I believe this is why most of God's Children are ignorant on this matter. Satan gives us a bare minimum of the truth, and a whole lot of mumbo-jumbo which does nothing for us spiritually. These "daily devotionals" give us just enough to make us feel like we've had our walk with God for that day. This is a big part of what is wrong with America today. We've got too many "so-called-Christian" TV and radio shows keeping people from their Bibles. There's too many "so-called-Christian" magazines and books that are steering people's minds and hearts away from God's Empowering Word. The great preacher Dwight L. Moody once said, "Most people have just enough religion to be miserable." This is so true! Have you been inoculated from the truth? Turn off the TV, the radio; Put down the magazine, pick up your Bible. "Having a form of godliness, but denying the power thereof: from such turn away" (2nd Timothy 3:5). Basically, the average Believer today is ignorant of the Bible; The unsaved are woefully ignorant. It is this ignorance of the Bible which has led to the acceptance of wolves in sheep's clothing sneaking into our churches. Let's not accept the premise that the tried and true Authorized King James is somehow outdated and is to be replaced by dozens of new translations. People have been getting saved by reading the King James Bible for a long, long time. We know that it contains the Word of Life whereby we live and grow. "For God is not the author of confusion, but of peace, as in all churches of the saints" (1st Corinthians 14:33). This whole matter of counterfeit bibles is of the devil. Satan is the true source behind the NIV, ASV, NKJV, etc, etc. New converts need God's Word, the King James Bible; not a watered-down variation. Their growth is dependent upon learning and memorizing the Bible. Have you ever tried to memorize the NIV? There's just no motivation to memorize it. On the contrary, the King James Bible grips your soul and begs to be in your heart and mind (if you love the Lord); One can't help but to memorize it's precious Words and doctrines. The proof is that I've yet to meet one single NIV boasting Christian who could quote me a single verse word perfect from the NIV. If they exist, I haven't met one. I've come to notice that the folks who love their Bible's the most are King James folks. When I was a boy; I remember my mother used to sleep sometimes times with a King James Bible clutched in her arms. How many NIV folks love their Bible that much? Come to think of it, how often do you see someone faithfully carrying their NIV. The devil figures that if he can't kill the babes, he'll do the next best thing--stunt their growth. The NIV is BAD news folks! Read the King James!! !